Now, please don't giggle too much, I had to balance the shelf on its side on the table so I could take a picture. I rotated the picture and added a bit of frost from PicMonkey to blur the background a bit. The wall hooks have not yet been added to the back of the shelf (but I think you may have guessed that). DH decided the shelf needed a bottom board that mirrored the top board. A piece of the base missing piece can be seen below. He copied the top board for the shape. 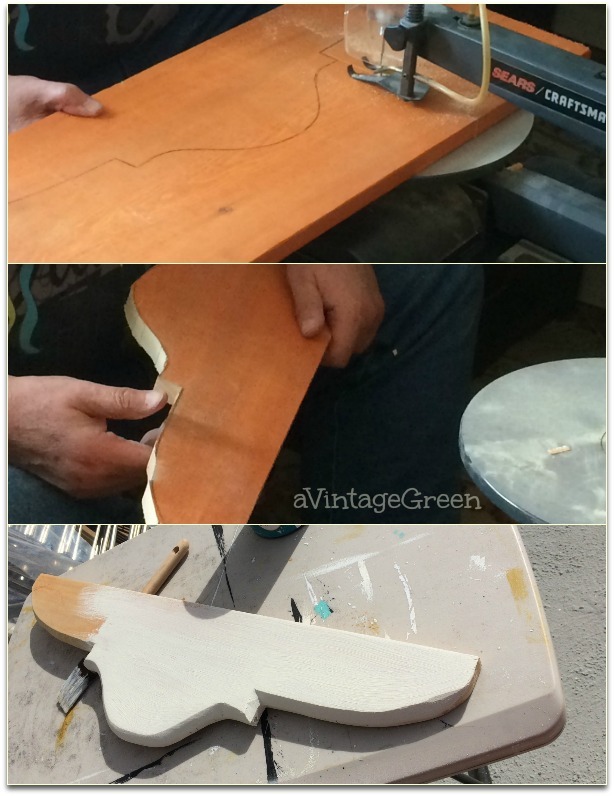 Making the bottom board involved finding piece of softwood (repurposed shelf board) that could be hand carved after the 'blank' was shaped into the bottom board, using an exacto knife with a fresh blade. I was away while DH did the carving, so no pictures, you can see the softened edge that was hand carved after the rough shape was cut on the band saw. Next job was trying to match the OLD paint for the bottom board addition. My job. You can see below that I have too much green in the yellow paint. For some reason I didn't take pictures when I was mixing the first of several tries to match the old paint. I got fairly close and then added reds and blacks (mixed) to give similar tones to the original boards. I painted streaks of a brownish red and a bit of black and some grey which certainly made a different look even though it does not really look like the rest of the shelf. Scratched the board with a screwdriver, wiped dark wax into the scratches, wiped off, scratched some of the mix off with my fingernails (more control that way). 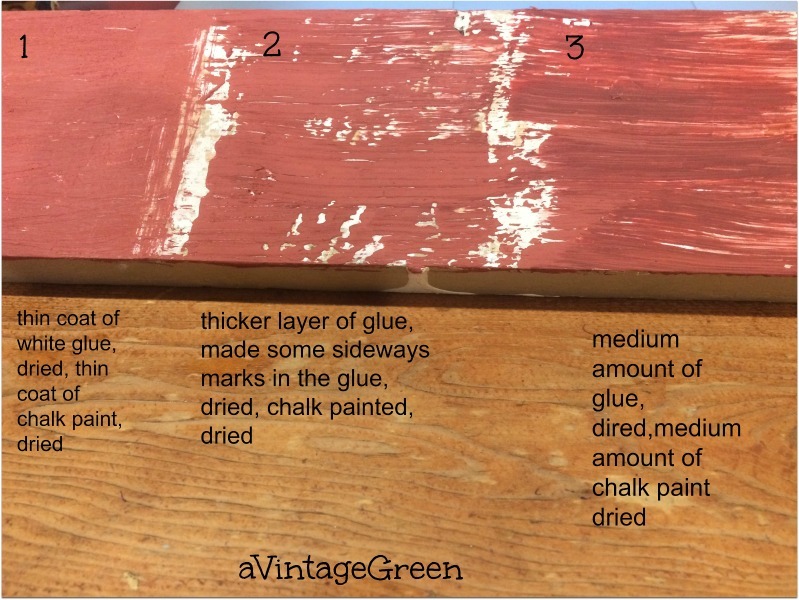 I also experimented with glue and paint trying to make a crackle finish (on another board) so I could have a bit more 'match' in the finish but had no success, so, another something I need to continue researching. 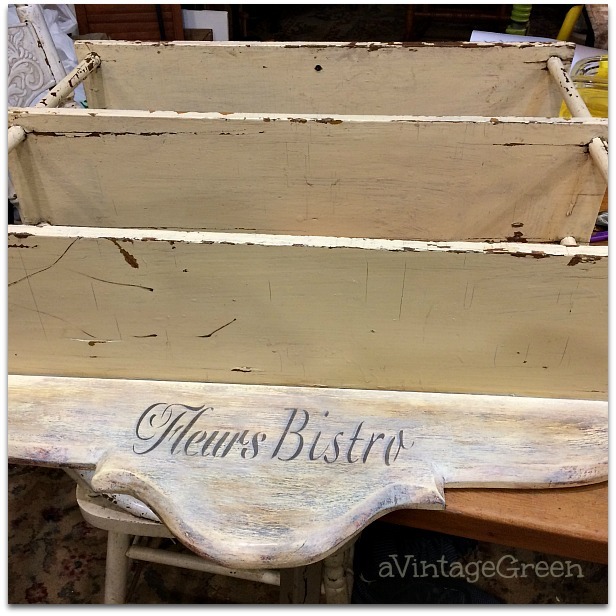 I want to buy some white/off white MMS's milk paint so I can heat the painted piece and get that crackle effect, just have to drive for a couple of hours... etc.) idea for a future painting project. 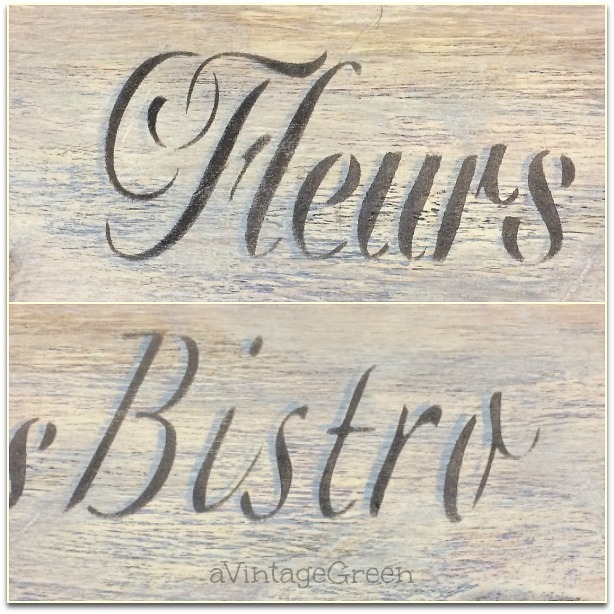 Next stencilled Fleurs Bistro in grey. I taped, dry stencilled and sanded. I sanded back the grey paint so that it looked faded, clear waxed and polished. Not really the look I imagined. Tried a few changes. Lightened the base with a dry brushing of Daffodil Yellow, sanded a bit and stencilled a darker grey over the first grey. The close up shows the shadow effect. Waxed with clear then dark wax, polished the entire repaired shelf with clear wax. Polished. DH will be adding two strong hooks on the back once I find them. This is about as shabby antique (ok the age is just a guess but it is very old and has a bit of a victorian look) as this piece can be after all the repairs and paint matching attempts. Just a small extra for the end of this post - we celebrated our 47th Anniversary on November 1st. Looking back in time (time machine in reverse) at the young couple that were married all those many years ago, so happy and so young! I loved purple and had heather sprigs pinned to my hair (picture is very dark, it was taken from a slide). Married by my Dad (an Anglican priest) in a borrowed church (St. Albans) and walked down the street to DH's Grandparents where my Mom had prepared a wedding buffet for all the combined families and guests. I don't think I appreciated, at the time, all the work Mom and Dad did to make our small wedding so welcoming and special. Thank you Dear Ones in Memory as Dad and Mom are both together in heaven now. I miss knowing they were close by so I could chat or visit or... just know where they were and what they were doing and that things were ok.
Nice post, Joy. Thanks. Sweet little shelf. Happy Anniversary! I didn't know Mom catered your wedding dinner party. It must be in my blood. I guess I was blind to all the things Mom and Dad did for us. What a great photo from the past! Your first pic reminds me of my whole apartment. Every time I try to take a photo something is always lopsided because obviously it's unlevel! Love that new shelf your husband carved out. How nice to have such talent in the home. :) Happy Anniversary! I knew we were soul sisters the moment my husband said "why didn't she just make a new shelf?" After 20 years he still hasn't a clue...maybe at 47 years he will start to get it? I hope so. 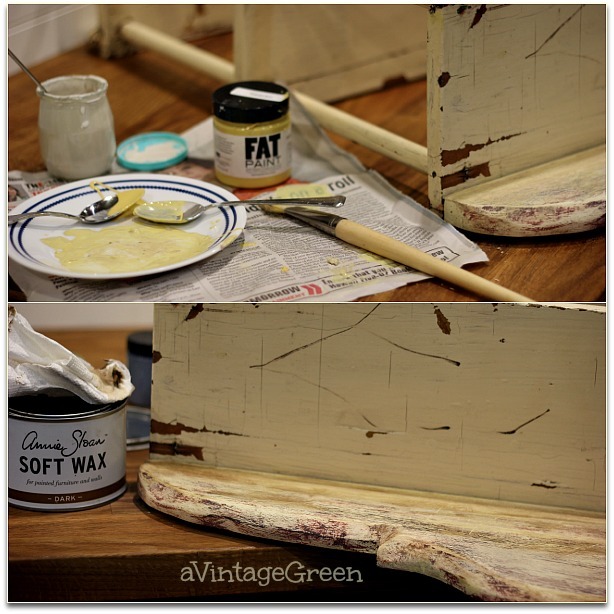 Love that you matched the paint by hook or by crook. You do such inspiring and remarkable work! Happy anniversary! So this is what true love looks like! I love that photo of the two of you! Happy Anniversary! It's fun to look back at old photos!! Love the shelf! 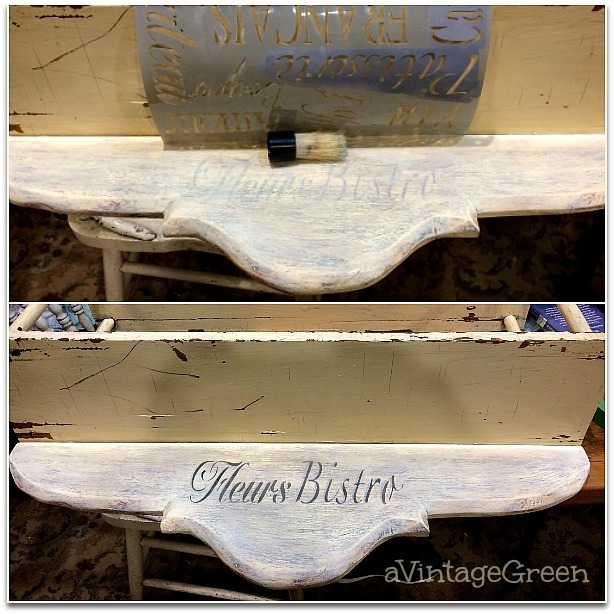 The soft colors and the stenciling just make it special. Love your new header photo! Hugs. I think you did an amazing job getting that wood to match the rest of the shelf. I know it was a lot of work! Doesn't it feel weird to try to "mess-up" the clean paint job in order to make it look old? It always does when I do a project like that. Ha! Happy Anniversary too! That's nicely done. 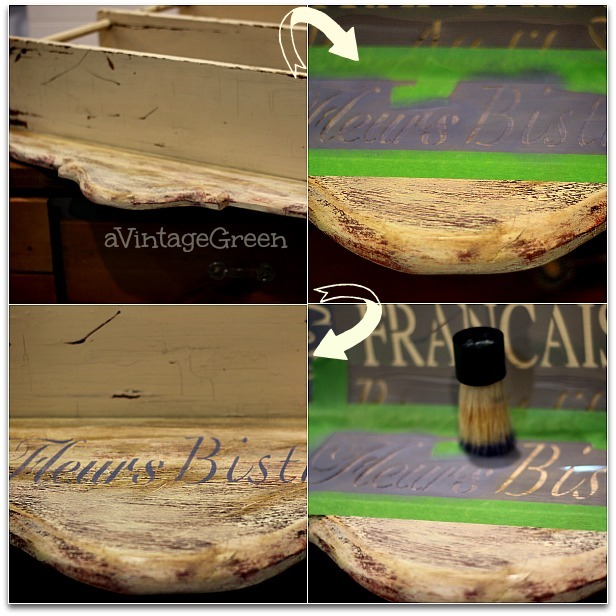 You just inspired me to re purpose our very old and unused wooden furnitures. Great job Joy ... matching old paint is the hardest ... likely almost impossible. 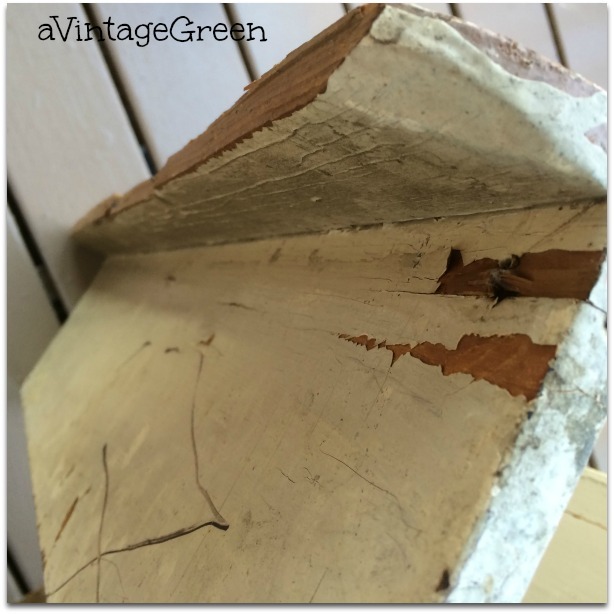 I just can't do it and end up repainting over all the old. The shelf turned out really nice though. DH did an excellent job with making and adding the piece. Love your wedding picture and congratulations. 47 years ... that is wonderful. This turned out beautifully. If that shelving unit could talk it would have lots of stories to tell. 47 years is amazing - Congratulations. Nice progress on the little shelf that could. Now to wait for part 3. Thank you for sharing at Snickerdoodle Create, Bake, and Make Link Party! Joy, it's a great little shelf and I think you did a fabulous job of making the new piece look old! Love that chippy character!! Congrats on your anniversary. Fun seeing your wedding photo! Thanks for sharing with SYC. Happy Anniversary!! I hope you are keeping that shelf and hanging it in a place of honor after all your hard work!! You two worked together to create that beautiful shelf - so great to see 47 years together. Congratulations! 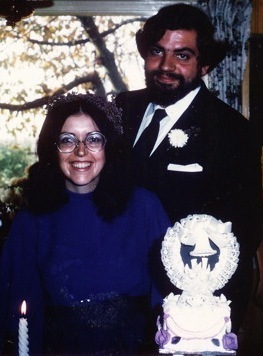 Congratulations on your 47th wedding anniversary, hat a great partnership you've created together. Now, about this shelf! 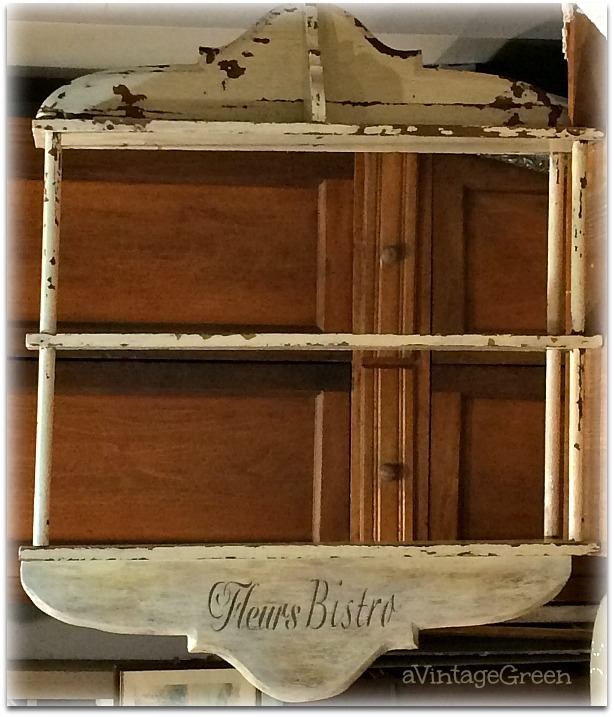 Fleur is our beautiful GS's name so I guess it her Bistro?? Love the little shelf that did! Happy Anniversary, Joy! 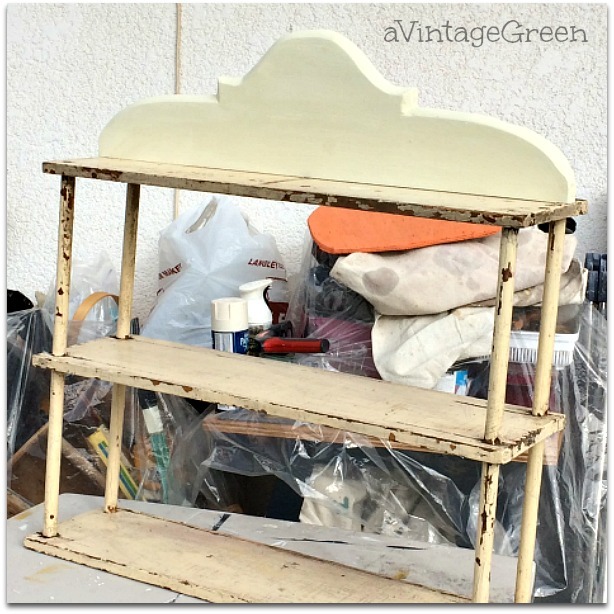 Your shelf is coming along nicely--thanks for sharing @Vintage Charm! Happy anniversary Joy! Your shelf is so cute. It needs some teacups! Thanks for sharing at Home Sweet Home! Aw, happy anniversary to you and your husband and how sweet for you to appreciate how much work your parents put into your special day. Wonderful DIY project too. Thanks for sharing with Small Victories Sunday linkup. Happy Anniversary Joy! 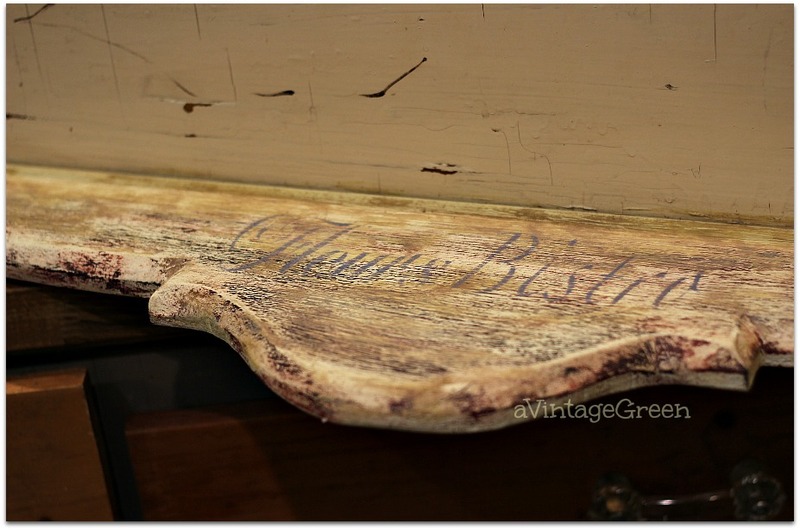 This little shelf is shaping up in to quite a beautiful antique. Lots of work but it is definitely paying off. I will pin this so that I can also age my projects. 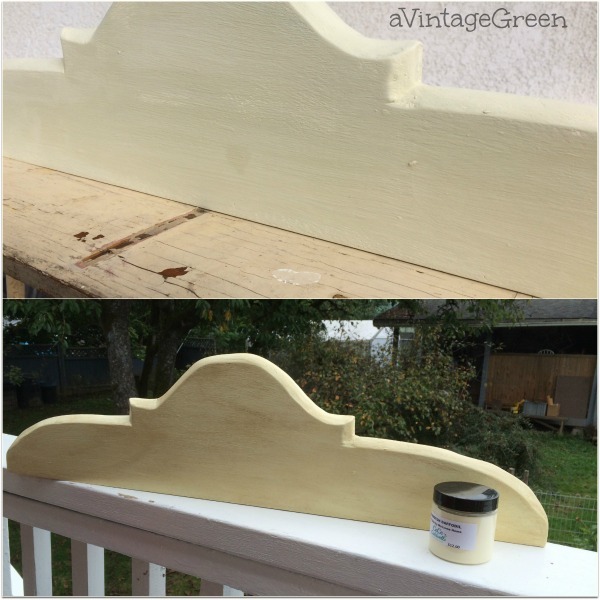 Thank you so much for this step by step pics on how you achieved the look with your shelf. I have something I want to do similar but really didn't know where to start. So thanks!